1) Benjamin Wittes on the Trump and the completely inappropriate approach to the CIA. 2) And this is insane. Bannon on National Security Council. Chairman of Joint Chiefs off?! WTF?!! 3) Duke fan or not, this essay from current interim coach Jeff Capel on his father (also a long-time coach) and ALS is terrific. 4) Older siblings typically out-perform the younger on average. Interesting mix of theories as to why. (And if you are reading this David Greene, let it incentive you to keep up with other older siblings). 5) When I first saw Trump had declared a “Day of Patriotic Devotion” I thought it was the Onion or something. WTF?? It’s like North Korea. 6) Bill McKibben on the many, many more bad days to come for the environment. In fairness to Trump, most Republicans seem to hate the environment. 7) Thought this was a really interesting finding that the ACT Science Reading sections literally make the ACT a worse predictor of college grades than just relying upon math and English. Sorry, David Greene, you still have to take the whole thing. (In case you were wondering, my firstborn does regularly read my blog now– I’m going to have to be more careful with some things). 8) Smart guy, good guy, and friend from grad school, David Kimball, with a nice piece on actually effective and meaningful voter reforms instead of Voter ID. When you observe or learn about proposals or actions that represent threats to democratic institutions or that violate the Constitution, point it out in public. Write, speak, and post in a variety of venues in a way that uses the research and literature in our field to demonstrate the consequences of proposals that threaten basic institutions. Be specific and matter-of-fact about how actions or proposals may weaken or violate basic American values and democratic norms. Focus on the agreed upon values of American democracy (e.g., civil liberties, civil rights, due process, respect for the rule of law) rather than on partisan or ideological components of actions and proposals. Engage with the media, public, and one another, on these matters; seek venues that provide broad exposure rather than speaking to a disciplinary audience, as is typical. Focus on evidence-based and theoretically rigorous findings that shed light on, or provide appropriate context to, current events. By being objective and scientific, we remain neutral, while showing how actions and proposals violate or threaten basic democratic institutions. Articulating and elucidating the public on these points is not only consistent with our academic mission; it is our responsibility. 10) Larry Summers says it’s time for business leaders to wake up about Trump. Hell, yeah! That said, we know that partisanship is stronger than religion. It’s probably also stronger than the profit motive. 12) Here’s why you should call, not email your legislators. For real. 13) Of course Trump’s tough-guy talk on torture risks lives. I cannot believe we have to go through this again! Ugh, the combined stupid and evil!! 15) Wilbur Ross and government by the ultra-wealthy. 16) Speed reading is great— so long as you are not interested in understanding what you read. Interesting discussion of the cognitive science behind why it doesn’t really work. And how to read faster (read more). 17) David Brooks on the politics of cowardice. 18) These nice little HuffPo graphic seems well-sourced, so I’m going with it. 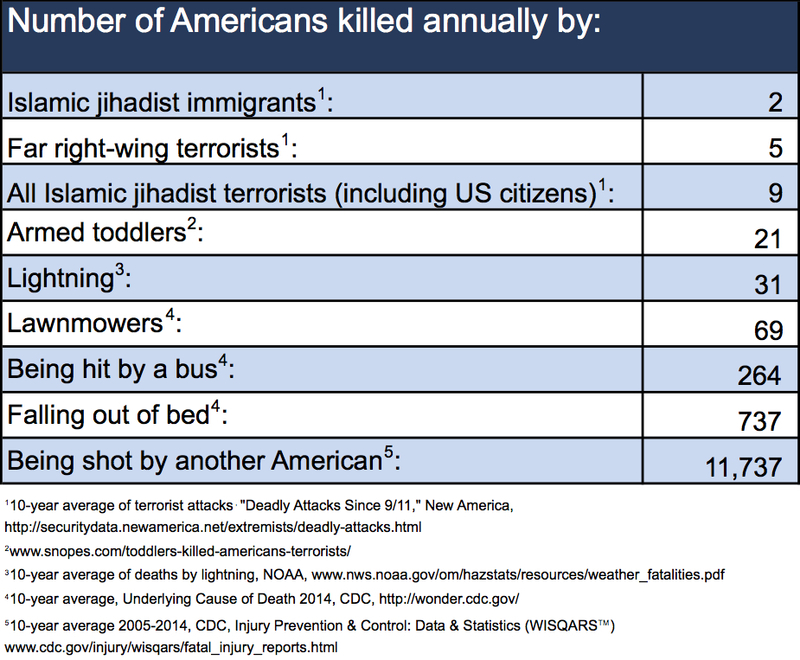 I’m really waiting for the armed toddler crackdown. 19) Emma Green asks, “Will the Pro-Life Movement Split With Trump on Issues Other Than Abortion?” Ummmm, no. The Pro-Life movement is largely conservative Christians, and we’ve seen they put the Republican party ahead of the actual teachings of Jesus most anytime. 20) Must read from a Reagan speechwriter on Trump and Holocaust remembrance day.